Colonial Charm, Volcano Views, Pool and Central Location! Brand new colonial home. 2000 sq. feet, pool, tropical garden, great location! Casa Uzma is truly a special home. Offering the comforts of a brand new construction but with all the traditional grandeur of a Spanish colonial home. 30 feet high cane ceilings, solid wood colonial columns, colorful handmade Nicaraguan floor tiles, indoor-outdoor patio, tropical garden, pool. This house is over 2000 sq. feet, offering 3 bedrooms each with their own private bathroom. The master suite occupies the entire second level offering uninterrupted views of Mombacho volcano and the top of the signature Granada cathedral from its private terrace and bedroom. In a safe and quiet location in the heart of the historical district of Granada, just 2 blocks from the main restaurant and bar street, Calle La Calazada and only 4 blocks from Central Park. Close enough to the action to be there in a short 3-minute walk, but just enough distance to get a peaceful rest. This house offers a unique experience. If you, like us, love to be catered to and pampered while you are on vacation, we have set up the house in such a way that you don’t have to lift a finger. You can have your own private chef come in and cook you any and all meals. So pick lobster, steak, fresh vegetables, local lake fish…whatever you like and have it prepared to your liking. You can also choose to have a driver, private tour guide, babysitter, private Spanish lessons, salsa dance lesson or relax with a massage, manicure and pedicure upstairs on the private terrace. In the main living area you can lounge on the couch and watch a great movie from our extensive DVD selection. Or enjoy a fine home cooked meal on our beautiful custom handmade wood dining table. The kitchen is fully equipped with state of the art new appliances, artistic wood countertops and everything you need to make yourself at home and cook up your favorite meal. The pool area provides a tranquil environment to lounge on a hammock and read a book amongst tropical plants of over 30 varieties. Take a dip in the Caribbean temperature pool and fire up the BBQ grill. The two downstairs bedrooms are located right off the pool corridor and provide views of the tropical garden and pool. Bedroom 1 has a queen size bed as well as it’s own private bathroom with a hot water shower. Bedroom 2 comes with two single beds and also has it’s own private bathroom with hot water shower. This bedroom can also be converted into a king size bed, if needed. If you are staying downstairs, you can roll out of bed and right into the pool or hammock. The upstairs master suite provides the utmost privacy for couples, even when traveling with family or friends. Close the door to your private terrace and you have a separate living space. Amazing views of Mombacho volcano from the terrace, bedroom and bathroom. You can even shower and look at the view! You can wake up to see the sunrise sky over the volcano and red tile rooftops of Granada, start the evening by enjoying the sunset view from the terrace while sipping a drink and then enjoy the starry night sky from the hammock right before retiring to bed. We are a couple from NY in the beauty business. We love to travel and stumbled upon Granada, Nicaragua during our travels through Central America. We instantly fell in love with the city and know you will too. We fell in love with the Spanish colonial charm of Granada the minute we stepped foot into this magical city. Colonial homes with indoor open courtyards and tropical gardens, amazing resturaunts, nightlife, museums and a prime location on Lake Nicaragua. Granada has it all. You can spend the day on the lake, go for a hike on nearby volcanos, be pampered with massages and fine dining, explore the pre-Columbian history, take a horse carriage ride through the charming colonial streets, party all night, or just relax at a cafe or by your private pool on the hammock. We hope you will fall in love with Granada the way we did. Enough to buy and create a beautiful home here with the colonial charm and all the modern comfort and amenities. We have taken care to create the most beautiful space with attention to every detail. The house was built new yet has all the elements of a colonial home. 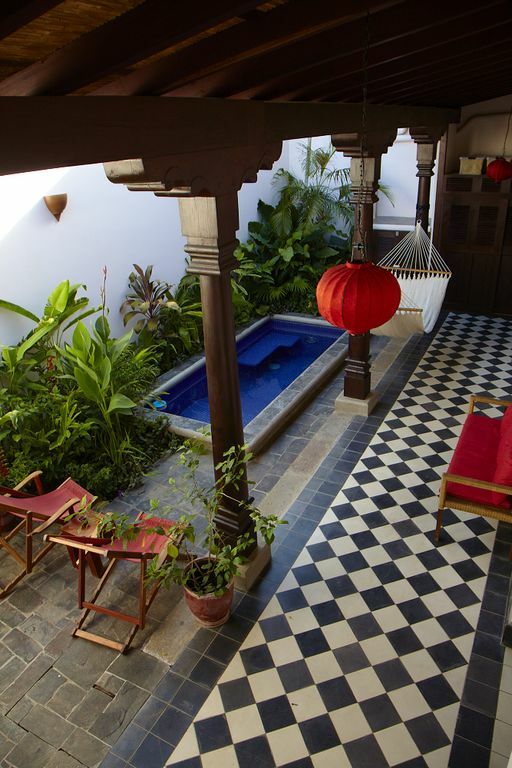 Beautiful handmade Nicaraguan tile floors, high cane ceilings, solid wood columns and an indoor-outdoor living style. The location is central, just a few minutes walking from all the main Granada attractions. Minutes from Lake Nicaragua with ocean like breezes flowing through the home. Very nice property, updated, yet traditional. It had a great view of Mombacho. The breezes were great. We enjoyed our time very much. Walk from the center of everything. The pool is great for cooling off and the kitchen is well appointed for cooking meals. The WiFi functioned and was a nice touch. A few maintenance items need to be addressed: the washer has a sketchy set of makeshift controls that are hard to figure out (we needed to wash towels as there weren't many provided). The shower and a/c in the master suite did not work through our entire stay and the upstairs hammock hangs too close to the ground to use. Family of 4 w/ 2 kids (8 and 5) highly recommend this house. Plus - Great house, central location easy pick/up drop off of keys, nice housekeeper, kitchen that actually had some cooking basics (spices, etc), book of local recommendations, working A/C units, water and power was fine for us. Also management was very responsive to requests and returned deposit within 2 days. Negative - nothing to do w/ the house but be warned the locals love to set off fireworks all night and early morning. Bring your earplugs. 100% recommend. Book it if available. Casa Uzma is a beautiful house. The garden and pool are delightful, the upstairs balcony has a stunning view of the Mombacho volcano. The house is well located within easy walking distance of the city center. Unfortunately when I stayed there for the month of August, 2015 there was no water in the house each and every day until mid afternoon. This is because the back-up water system in this house does not work. The owners need to install a pump to fill the water tank on the roof. There is not sufficient water pressure for the tank to fill without a pump, and as of August 2015 there is no pump. I was forced to shower in the morning using a bucket of cold water, which I had to fill each night. Before you rent this house, which is quite expensive, I recommend you make sure this problem has been corrected. The house could be improved by getting a more powerful WIFI, a microwave oven, cloths pins and a can opener. We are sorry for your inconvenience as this is the first time this has ever happened with a renter. Unfortunately, the city of Granada is having a water issue in the entire city over the last month and you came during that time. Our water backup system is top of the line but water is needed to fill it. As of the writing of this response, the water in the house was working perfectly fine. We booked our stay with very short notice. The owners were quick to respond. Casa Uzma is beautiful. It has a lovely view of Volcano Mombacho from the balcony. The house is a close walk from the town square. There are many short day trips nearby. We found our stay to be very comfortable and relaxing for our family of 4. Even our teens were pleased. Can't wait to return again one day! We stayed at Casa Uzma for 2 nights while visiting Nicaragua. The home is beautifully designed and extremely comfortable and relaxing. It also is perfectly located for exploring Granada. We highly recommend Casa Uzma. We can't wait to come back! Electric cost in Nicaragua is very high with the approximate cost being $.50 per kilowatt hour. Ten percent (10%) of your daily or weekly rental rate is towards the payment of electrical usage. We take a security deposit of $400 for damages and electrical overages. Your meter will be read upon check-in and check-out and any excess will be deducted from your security.